I'd only want to play this by use of its text as the icons and skill are weak for cost 3, even in day or night. For a quick rush in such a deck there is potential, though I'd ideally want either resource ramping or a very cheap curve to ensure I can keep up later. If my deck runs neither day nor night its a definite no. I could see using The Gold Pocket Watch after the opponent commits defenders being fun, but overall I can't see it making the cut. Zoogs were a bad idea, a bit of domain manipulation and draw but lacking support outside the cycle. 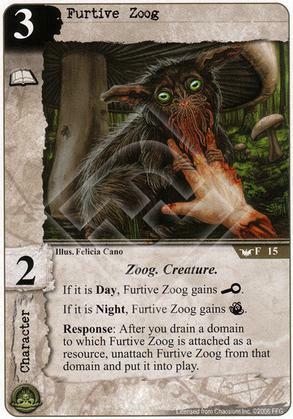 There are 10 cards that are zoogs or have zoog synergy and none which make this character worthwhile. The only use I would have for him is to trigger a plague stone and put him into play as the only character. I guess it's not a bad thing to have in the late game if you find your domains are clogged with too many resources? It's really awful to play via hardcasting, and only barely passable if you have day/night effects and use the response to cheat it in. You're still losing a resource by doing it that way, though.